Product and news updates from YourBagTag.com – Tagged "Custom Tags"
There’s no doubt, YourBagTags are the perfect luggage tags for airport travel. They are sturdy and easily recognizable. But you can use them in other ways too…in fact, many of our loyal customers have come up with fun and creative ways to use personalized bag tags well beyond simply marking their luggage when they travel. Going on a vacation with family or friends soon? 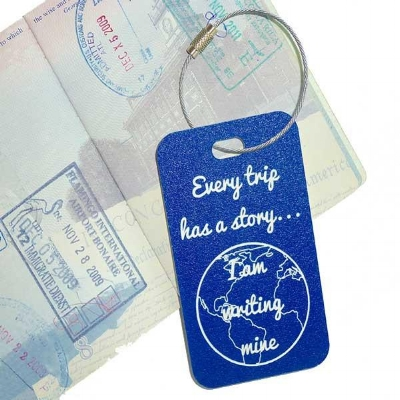 Then why not commemorate the trip with a set of custom luggage tags for the occasion? We can customize them for any event – just send us the details and a simple logo or picture (if you have one that you want to use). Have a family ski trip planned this winter? Headed out on a cruise? We can create tags for all of your luggage with the date and location of your awesome trip. Not only will these tags help you identify your bags, you and all your travel mates will have a special memento to remember the trip for years to come. YourBagTags also work great for sports team travel. In fact, our customers include NBA teams (like the Los Angeles Clippers) and USA soccer teams. They use our sturdy tags to easily identify and label their sports team equipment and travel bags. But you don’t have to play professional sports to use them! We can create custom tags for college teams, AAU teams, or any other recreational or competitive sports team that travels to competition. You can personalize them with your team’s colors, logos, and each player’s name. Think about how easy it would be to find your team’s bags the next time they are all standing at the baggage carousel waiting at the airport! Want your gifts to stand out this holiday season? Use YourBagTags to add a personalized touch to them. 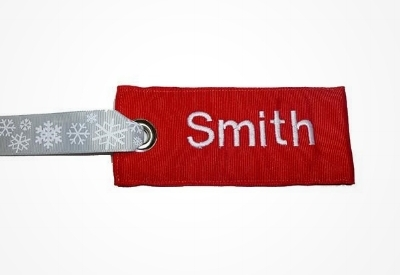 Instead of using typical paper gift tags or stickers, order custom luggage tags with your recipients’ names on them. These special tags add a functional and unique touch of personalization to your gifts. They demonstrate that you go out of your way for the people you care about, leaving no detail to chance. These would make a great addition to gifts for friends and relatives who frequently travel. Coming up with a unique and fun gift for your wedding party can be a challenge, especially if you are on a budget. YourBagTags make a great personalized gift for your wedding party. Think about it, there’s a very good chance that your bridal party, groomsmen, and family members will have to travel to your wedding. Perhaps many of them will fly in from out of town. Why not give them a gift that not only marks the special occasion but also helps them identify their luggage easily when they head home. Another great way that you can use YourBagTags is by giving them to your loyal customers. Your customer tags could include your company name and logo as well as a place for customer information. We offer a wide selection of tags depending on your type of business – including elegant, personalized leather tags to sturdy that you can even fit a business card in. Our friends at DJ’s Scuba Locker give personalized tags to all of their customers who book dive travel with them to commemorate their trip. 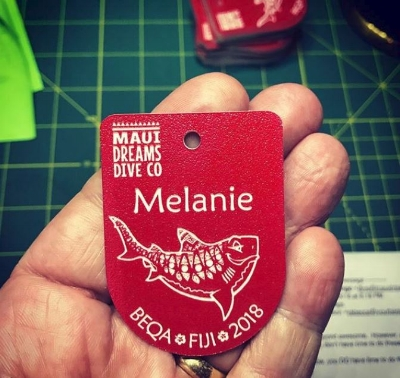 And we made these tags for Maui Dreams Dive Co’s recent trip to Fiji. Personalized gifts and tokens of appreciation are special. They do require a little extra time and effort – but that is a big part of why people enjoy getting these gifts. They recognize that you did take extra time to make them feel appreciated. But the good news is that with YourBagTags, the extra effort and time is minimal. We make it easy for you to look good! Simply send us the information and logos you need on your tags and we’ll have them ready quickly for you (2-3 days in most cases). Have questions or comments? Send us an email at info@yourbagtag.com or give us a call at 479.553.7275. And if you’ve ordered from us before, we’d love to hear from you. What are some fun and creative ways that you have used our personalized bag tags? Since our earliest days, YourBagTag has focused on providing custom scuba tags for dive enthusiasts. And many of the ideas for the equipment tags, personalized zipper pulls, and work order tags were a result of a collaboration with our dear friends Dan and Cindy at DJ’s Scuba Locker. This week, we’re sharing their story and we think you’ll find them as amazing as we do! DJ’s Scuba Locker, located in Brookfield, IL, opened its doors in 1995, but Dan and Cindy’s passion for diving started way earlier. Dan was a certified diver when he and Cindy met. Although Cindy was not, she quickly developed an interest and in 1984, the year they were married, she earned her diving certification. Dan became a certified PADI instructor in 1986 and they started a dive club. After several years of traveling with their dive club, they decided to take it to the next level and opened their own dive shop. So in 1995, DJ’s Scuba Locker opened in a small storefront in Lyons, IL. As the business grew, they eventually moved to their current location in Brookfield in 2012. DJ’s Scuba locker is a full-service SDI/TDI/ERDI Professional Develop Center and a PADI Dive Center, specializing in Public Safety Dive training, equipment sales and travel. DJ’s runs three to four scuba diving trips per year to amazing locations such as the Cayman Islands, Maldives, Cozumel, and Bonaire. DJ’s also works with Fire Department dive teams, providing them service for their dive equipment, training and purchases since 2006. DJ’s works with over 65 of these departments and partnered with the Romeoville Fire Academy in 2012 to instruct their subsurface classes through ERDI. In 2016 DJ’s Scuba Locker became the National Service Center for the Interspiro Surface Supplied Air Systems, which are used by fire departments for recovery, rescue, and locating evidence. In addition to being an awesome dive shop and resource for fire departments, DJ’s Scuba Locker has found several ways to give back to the community by sharing their love of everything diving. DJ’s is a strong supporter of Soldiers Undertaking Disabled Scuba (SUDS) program whose Instructors teach Veterans from Walter Reed and Bethesda hospitals how to scuba dive. They also participate in fundraisers for these Veterans and are proud to say that one of their amazing customers even sponsored a SUDS diver on a recent trip to Cozumel. Additionally, each year, DJ’s partners with the Shirley Ryan Ability Lab and the Wounded Hero Foundation to support Wounded Veterans through an adaptive sports and military camp. These Veterans come to camp for a long weekend event to participate in a round robin of sports including rock climbing, basketball, swimming, and of course, scuba diving. Besides donating the equipment, dive instructors and volunteers, DJ’s teaches Veterans how to scuba dive and play games underwater such as, hockey, torpedoes, and underwater bubble guns. According to Cindy, the underwater scuba games are always a big hit for the Veterans. This past year, DJ’s designed a challenge coin for all Veterans who participate in the scuba portion during this camp. When they complete the challenge, a scuba instructor and military veteran who works for DJ’s, palms the Veterans their challenge coin underwater. DJ’s also works with the Shirly Ryan Ability Lab to sponsor scuba programs for children who have disabilities or have been injured. Some of these children have the opportunity to get certified in scuba. DJ’s partners with a dive shop in Florida, Sea Dwellers Dive Center, who provides the dive boat and crew for the dive trip with the kids. Yes, we think DJ’s Scuba is pretty special. And we are proud to say that they’ve been with us on our journey from the very beginning. When we first had the idea to create tags to help scuba divers identify their gear, we approached Cindy and Dan and asked for their help. They donated props and let us borrow equipment to test our ideas on. And they provided ongoing feedback and suggestions for new products to service scuba divers, dive shops, and dive resorts. DJ’s was instrumental in helping us come up with many of the ideas such as the wetsuit zipper pulls and custom mask straps. Together, we also came up with the idea of the Velcro straps for scuba tanks to help identify them. Cindy also asked us to design work order tags to mark their customer gear and writeable BCD tags for tracking equipment, which we were happy to do. So, we worked with DJ’s to design these tags for their needs. Two examples are below. We were more than happy to help Cindy and Dan come up with a more efficient way to track service orders and mark dive equipment. It has been a great partnership over the years! They are one of many dive shops across the country and around the world that we are proud to partner with. Whether you need custom tags to identify your dive shop gear, mementos for your dive travel customers, or a custom solution like DJ’s work order tags or BCD equipment tags, we are happy to help you make your dive shop stand out. Give us a call at 479.553.7275 or send an email to info@yourbagtag.com. Summer may be over, but it doesn’t mean that fun family vacations have to be. Fall is officially here bringing along with it cooler weather, changing leaves, and plenty of fun adventures to be had. Fall also means that the holidays are just around the corner! Does your family vacation during the holidays? Whether your family has a winter ski trip planned, a cruise, or even a road trip to see extended family, with a few dollars and a little pre-planning, you can make your next family vacation unforgettable – literally! Here at YourBagTag, we are big fans of personalized products (especially custom luggage tags) because it’s these “little” things that help you keep the memories fresh from the precious times that you share as a family traveling. And those memories matter. Here are some fun and fabulously affordable ways to commemorate your next family vacation. A popular trend that more families are starting to do is to mark their vacation, family gathering, or event with personalized t-shirts. You’ve probably seen these around….at the airport, on the cruise ship, or even online at social media sites like Instagram and Facebook. Matching t-shirts leave a lasting memory of the event. Every time you see your shirt in the closet, it takes you back to that fun cruise or ski trip you took with your loved ones. Plus, these make for great photo ops! Wear your custom t-shirts on the day you head out to get everyone geared up for the adventure. Or, choose a particular day where you plan to take plenty of family photos. These shirts are pretty inexpensive and a fun way to commemorate your trip. We’ve seen some families get t-shirts for every day of the week! (This seems to be particularly popular for trips to Disney). But why not? Not only do they make great pictures, you don’t have to figure out what to wear each day! And getting your shirts made is easy. You can order shirts online or find a local business that specializes in custom t-shirts, like Big Frog Custom T-Shirts and More here in Bentonville, AR. Traveling can leave you feeling dehydrated – especially air travel. So get your thirsty travelers each their own personalized tumbler. There are so many different types to choose from! You can select plastic cups, stainless steel, water bottles, mugs, or even a sippy cup for your tiniest travelers. Like personalized t-shirts, these are not hard to find. Purchase them at a local gift shop, or find them online at places such as Etsy or Amazon. Tervis even offers a variety of personalized cups online. Bonus tip: In addition to putting your vacation destination on your travel cups, it’s a good idea to include each of your family members’ names on theirs to keep them from getting mixed up! Today, capturing the moments of your trip is pretty easy with our sophisticated phones. Some of the latest ones have unbelievably good cameras! But what happens once you’ve taken your vacation photos? Do they remain on your phone? Do you upload them to social media? Neither of these is bad, but they aren't always accessible to other family members…especially children who aren't old enough to see the photos on social media. So, collect your great family pictures and capture cool photo ops throughout the trip, then turn them into a family photo memory book! Shutterfly has a fantastic collection of templates for travel photo books. Whether your family went backpacking, skiing, cruising, or even took a trip to the Big Apple, you’ll find a nice selection of travel book templates allowing you to mark the memories forever. Did you know that you can mark your luggage with a fun, custom tag for any special occasion! Of course, you’ll want to include your contact information on your luggage tags, but why stop there? If your family is planning a special trip, order customized suitcase tags to commemorate the occasion. At YourBagTag, we create tags that you can use on backpacks, carry-on bags, suitcases, and any other travel gear. You can send us your logo or tag idea, or choose from one of our fun designs - like this one from our friend Lisa Miceli at Stoked On Salt. Order a set of these, or one of our other fun designs for the whole family for your next vacation – and make sure to tell us where you are traveling to so we can include it on your tags. Not only will these tags remind you of your amazing family vacation, but you'll also be able to spot your bags easily at the airport baggage carousel! They may even help you get through the line faster. “ When we were in the Miami and Bonaire airport.... we were able to skip the long line because of our Luggage Tags we bought.... everyone else had to sit and write their contact info on the paper tags but not us! We had all our info on the tags!” – Lisa Miceli, Stoked on Salt. How Will You Make Your Next Family Vacation Memorable? As you are planning your next family getaway, start thinking about how YOU are going to commemorate it so that your family remembers this special time for many years to come. Now, if you have teens, they might roll their eyes a few times (especially if you ask them to wear matching t-shirts), but at the end of the day, they'll cherish the memories as much as you. When you look back at your fun tumbler, your photo book, or your cute bag tags, it will trigger those priceless memories over and over again! Two years ago at the Diving Equipment Marketing Association (DEMA) show we had several cave diving friends ask us if we could make custom cave diving arrow markers. Of course, we were happy to make their custom markers and thought that the cave diving arrow shape would make a very sharp looking gear bag tag as well. The Scuba Cave Diving Luggage Tag was born! These would also make great give-aways for dive shops or dive resorts that specialize in cave diving instructions and trips. Do you have a family reunion coming up? Perhaps you own & run a Bed & Breakfast. 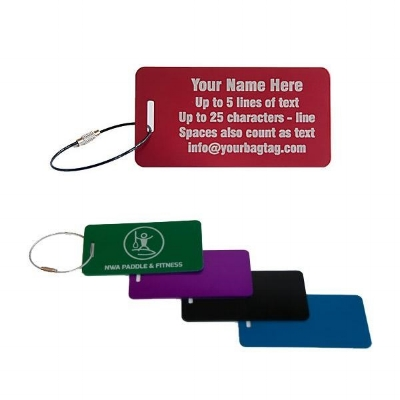 Custom fabric luggage tags offer that touch of personal warmth that plastic or metal tags just can't deliver. The tag featured above is an example of a custom tag we made for a local ranch - we took the color pattern inspiration from their business card. Our family has always enjoyed giving small Christmas Stocking gifts to each other as one our holiday traditions. Stocking stuffers are always a mixture of fun and practicality. 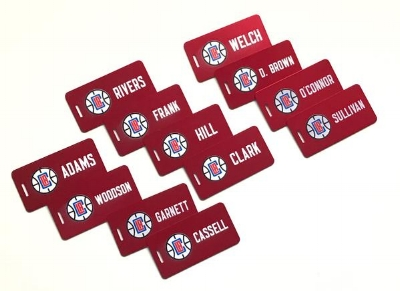 If you are looking for wonderful Christmas Holiday stocking stuffers, consider putting these personalized luggage tags on your list. Our personalized fabric luggage tags come in a very wide variety of colors and are only $12.99. Another great stocking stuffer idea for that world traveler on your list is our Extreme Luggage Tag. Like it's fabric cousin, it comes in a wide variety of colors and can be attached with wire loops or carabiners. Looking for a tag with a bit of humor? This whimsical take on "Keep Calm" might be the perfect present and at $7.99, it won't break the bank. This funny stocking stuffer comes in a wide variety of colors and can be made with a ribbon handle or stainless steel cable loop. Our laser engraved combo set is one of the most popular products. This luggage tag set comes with 2 tags, one for your suitcase and one for your carry-on and comes in many different colors. Just $11.99 for the set. Still out of ideas for a holiday gift? YourBagTag gift cards are a thoughtful way of letting your favorite people pick out their own personalized luggage and scuba ID name tags. They can be ordered in values of $15, $25, $50, $75, & $100. Scuba Cave Diver? Show Them!